The current edition opens the publication of a series of albums of drawings titled Unconventional Sources on the History of China during the Qing Dynasty (1644 - 1911), ed. by Acad. V.S.Myasnikov. This book reproduces two albums of min-su hua, i.e. 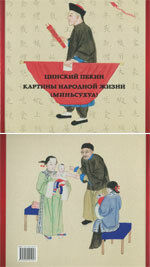 pictures of folklife (totaling 218), from the collection of the Institute of Oriental Manuscripts of the Russian Academy of Sciences. The drawings, commissioned by the Russian diplomat AF. Popov, depict street scenes, the work of artisans and peasants, and a number of customs and ceremonies. They all accurately reflect the everyday life, morals and manners of Beijing during the late Qing dynasty. Russian translations are provided for the explanatory notes to the pictures. On March 14, 2018, at the IOM RAS the fifth St. Petersburg Conference Issues of Buddhological Studies will be held in the IOM RAS.